Before 1951 Nepal was inaccessible to foreign tourists, and until 1964, travel to this wonderful and mystical land, was exclusively an attraction for the hardy climbers and explorers of the unimaginable. In recent years with the advent of tourism programs and several air linkage with the outside world, travels to this land of adventure has become most coveted for all kinds of travelers. In its immensely diverse and undulating topography, varied climate and mix of people combine to produce a magical attraction for outsiders. Many of these foreign visitors come to trek one or more of the many beautiful trekking regions now opened by HMG. To trek, one does not have to be bizarre, neither a mountaineer nor an athlete. 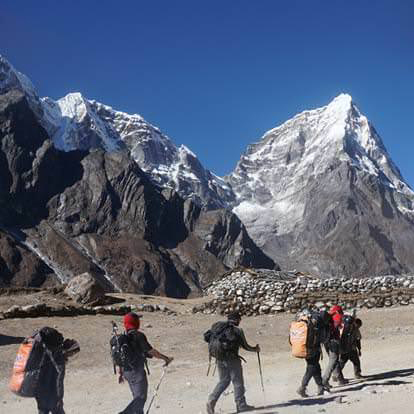 Anyone with a pair of strong legs and the spirit for adventure will enjoy the thrills of trekking the hills of Nepal. Walking in the interior of the country follows ancient foot trails which meander through the scenic river banks, terraced fields and the forested ridges connecting picturesque hamlets and mountain villages. For visitors on extended holiday, there is an even more varied spectrum of adventure-be it rafting on sparkling rivers, safaris in the jungles, trekking to explore deeper into the alpine valleys with perpetual snow and glistering glaciers. The more intrepid traveller may venture further up to scale any of the 18 minor trekking peaks. The consummate classical experience in the Himalayas is to commune with nature; cutting loose from the trappings of concrete jungles and the frenzy of modern life. The attained experience is extremely rewarding and rejuvenating.